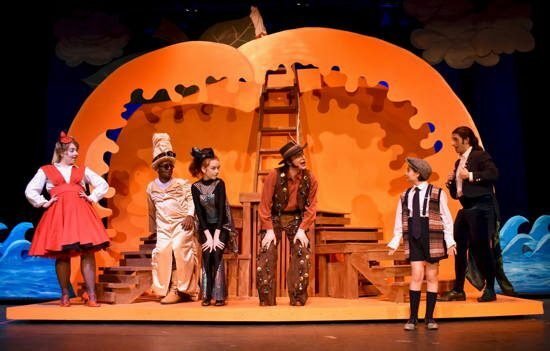 The cast of ‘James and the Giant Peach.’ Photo provided by Port Tobacco Players. Roald Dahl is a favorite author among many young readers, creating beloved stories such as ‘Willy Wonka and the Chocolate Factory’, ‘The BFG’, and ‘Matilda’. Among those beloved stories, one finds an imaginative tale about a little orphan boy, a giant peach, and his new-found ‘bug’ friends. “James and the Giant Peach” may not be as well known as the stories mentioned above, but Roald Dahl certainly doesn’t fail to deliver the same wit, imagination, and curious characters that make his stories so accessible to readers of all ages. Port Tobacco Players Theatre, located in La Plata, MD, just opened their children’s production of “James and the Giant Peach.” Roald Dahl’s story, adapted into a musical by Timothy Allen McDonald (book) and Benj Pasek and Justin Paul (music and lyrics), captures every bit of whimsical fun as it deals with the ever-changing definition of what a family really is. The story follows James Henry Trotter, an orphan boy, who is sent to live with his two tyrannical and scheming aunts. He, through the discovery of a spell book, inadvertently grows a giant peach from the peach tree and brings a spider, centipede, grasshopper, ladybug, and glowing earthworm to human size. Together they escape his awful aunts and journey across the world, learning many wonderful lessons from one another along the way. Truly, this fantasmariffic, splendiferous, specmagical, remarkulous, peachy good show is not one you will want to miss! 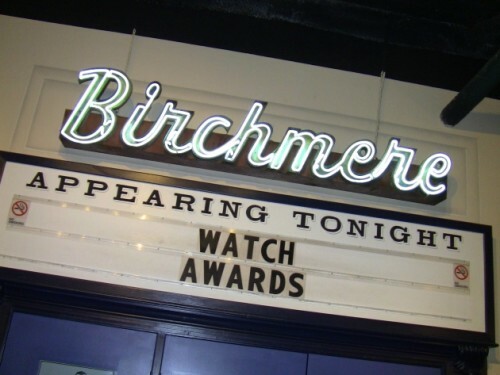 This is a peachy good show! From opening curtain to final bows, I found myself immersed in the world of Roald Dahl and drawn to this heartwarming tale of a young boy who just wants a real family. On opening night, the role of James was played by Lucy Mudd (she shares the role with McKenna Wohlfarth). Both handled themselves with a massive stage presence, and poise beyond their years. Lucy’s vocals as James during “Middle of a Moment” were spot on, and her belting range is quite impressive. Michael Margelos (Ladahlord) was breathtaking in his vocal performances. I really thought that the inclusion of a ‘Roald Dahl’ character to tell the story was creative: kudos to book writer Timothy Allen McDonald for that creative choice. Each of the creatures that joined James on the peach was carefully cast, as is evidenced in their performances. Centipede (played perfectly by Anthony Dieguez), Grasshopper (cleverly portrayed by Sean Michael Fraser), Earthworm (portrayed hilariously by Kenneth L. Waters Jr.), Ladybug (delightfully portrayed by Celena Hansen), and Spider (a poised and majestic performance by Emily Lane) all rose to the challenge of embodying their respective characters through physicality and vocal performances. This cast is quite talented! The villains stole the show at a few points. Aunt Spiker (portrayed by Liz Mildenstein) dripped with such sarcasm and horrid demeanor that I genuinely disliked her pure existence. My personal favorite of the show was Aunt Sponge (played delightfully by Katie Ludy). Her character was evil with a side of childlikeness; I loved her character choices! All of these incredible actors and actresses were led well by director Matt Jameson. He really put together a talented cast, and an equally amazing crew. The set was minimal to start, but the massive peach was simply breathtaking: kudos to set designers Amy and Richard Cooksey for this masterpiece. Scenic Fly Designer Ronna Johnson really added another level to the setting with her beautiful designs. Sound Designer Jason Klonkowski ensured that all of the performers were vocally balanced with the live orchestra, and the light crew (headed by designer Leslie Wanko) were ‘spot on’ throughout the entire show. Of course, my favorite element of this show was the use of puppets. Puppet designer Sheila Hyman certainly created some fun puppets that added a level of symbolism to the beginning of the show that I really enjoyed. The costumes, designed by Carol Russell, were full of color and fun. My personal favorite was Centipede’s (the tiny boots must’ve taken days to sew on). The hair and makeup team, led by Sheila Hyman, certainly had their hands full with the number of wigs that graced the stage. I really liked the makeup choices for the Centipede, Earthworm, and Grasshopper. The orchestra was beautiful and added depth to the show as they played. Paul and Pasek’s music is lyrically fun to listen to, but the orchestrations are simply stunning. I really enjoyed listening to the 17 piece orchestra, led brilliantly by Conductor Zach Ball. This show features endearing songs such as “Middle of a Moment” and “On Your Way Home,” along with fun dance numbers like “Shake It Up” and even funnier comedic pieces like “Plump and Juicy.” While “James and the Giant Peach” may not be a musical everyone has heard of yet, it really is good fun! My only question after leaving the show that night was regarding a director choice during “There’s Money on that Tree” in the First Act. In that song, a variety of seemingly male reporters were portrayed by the female ensemble members dressed in suits. Then, when the song mentioned how the ladies felt, the male ensemble members appeared on stage dressed as ladies. While the audience enjoyed a good laugh at the mayhem, I wondered why Director Matt Jameson made this choice if he had enough females to play the female characters and vice versa. This show is perfect for audiences of all ages, given the fun nature of the show and the colorful performance. It is filled with life lessons and fun moments, all while delivering beautiful music and poignant lyrics. Even if you’re not a fan of Roald Dahl (and I’ve never met anyone who wasn’t), this show is sure to ‘grow’ on you. Truly, this fantasmariffic, splendiferous, specmagical, remarkulous, peachy good show is not one you will want to miss! Advisory: Some ‘more adult’ humor and suggestions, but it will fly over children’s heads. Best suited for anyone who loves to laugh, enjoys Roald Dahl, or is just looking for an unforgettable story. Running Time: Approximately 2 hours, including a 15 minute intermission. “James and the Giant Peach” will be playing at Port Tobacco Players in La Plata, MD until April 7th, 2019. A special sensory performance will be performed March 16th at 3 p.m. For more information, or to purchase tickets, please see here.